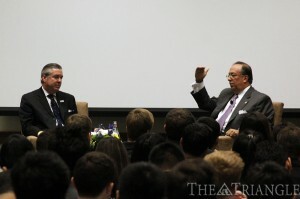 Drexel University’s LeBow College of Business presented a fireside chat Oct. 28 featuring alumnus Dominic J. Caruso, class of 1980, corporate vice president of finance and chief financial officer of Johnson & Johnson, along with Drexel President John A. Fry. Caruso graduated from Drexel with a bachelor’s degree in business administration and now earns a total calculated compensation of over $8 million as of fiscal year 2012, according to Bloomberg Businessweek. The event followed a conversational format between the interlocutors, where the dialogue consisted of questions covering topics concerning leadership, strategies and innovation within J&J. J&J, a U.S.-based multinational manufacturer, currently employs 300 Drexel alumni across borders. Fry started the chat by asking Caruso how he plans to foster innovation within the organization. Caruso disclosed that the undertaking has been a struggle for J&J over the past 10 years. In order to solve this dilemma, Caruso asserted that J&J has been focusing on external innovation rather than internal, allocating capital to the most deserving investments to benefit their corporation. He described J&J as agnostic, where management encourages employees to have an open mindset toward innovation and creativity within the workplace. Furthermore, Caruso pointed out that 11 percent of J&J’s sales (of the nearly $70 billion it grosses in sales annually) are used to fund research projects of such innovative nature, which he emphasized separates the company from that of its competitors. Later on, Fry continued the conversation by asking Caruso to describe how he plans to overcome the challenges and obstacles currently facing J&J as a result of the recent economic slowdown and health care reform. Caruso explained that the credo, strategic principles and financial principles adhered to by the medical manufacturing giant will ultimately guide the way to overcome future hardships and difficulties in the path that lies before them. J&J’s credo consists of having responsibility to four key groups: its customers and patients, employees, communities, and shareholders. The strategic principles of the corporation include being broadly based in health care, focusing on managing for the long term, and operating under a decentralized management approach through a unique culture that fosters and values the development of their people. When asked during a question-and-answer segment about his thoughts on what the biggest challenge facing J&J is, Caruso said that ensuring all of the company’s 128,000 workers move forward with utmost integrity is the biggest concern. “Despite these credo values, there will always be a rogue employee who won’t do something at the standard we would like. … It’s not challenging, just worrisome,” he said. Caruso had the opportunity to pass on some helpful advice to the students in the room. Stemming from his personal success, he suggested that students find good mentors from both similar and unrelated fields of work, thus permitting a more rounded perspective toward reaching one’s goal. Although Caruso worked mainly in the field of finance, he admitted to stepping outside his comfort zone and seeking mentors in the research field too. He also encouraged students not to be afraid of challenging opportunities that may be uncomfortable, as they may be most rewarding once conquered. Caruso stressed the importance of living by a core set of principles.